Are Desktop Apps Getting Short Shrift? Have you noticed… Microsoft has replaced the word “program” with “app” throughout its Windows lexicon? You have to dig into your system’s directory tree to find C:\Program Files these days. And I just can't get used to the concept of going to an "app store" on my Windows desktop computer. Google recently announced a new trip-planning search service called Destinations On Google. It’s available only on phones. Apparently, Google thinks nobody plans a vacation in the comfort of his or her home any more. Uber, Lyft, and other ride-hailing services are available only to mobile users. Is there really no need for a desktop version of these things? Instagram, the popular photo- and video-sharing social network, has no desktop interface. There are several third-party workarounds but they all have drawbacks. Aside from being clunky, unreliable, or inconvenient, using some of these hacks can get you banned. Instagram wants you to snap a photo with your smartphone, then share it using their app. But what if you have an older flip phone? They have cameras, too. And what about all those beautiful photos you took with your old-school digital camera and stashed on your desktop? No Instagram for you! Square Cash started out as an email-based money transfer service. Today, the email option is being deprecated (phased out) in favor of Square's mobile apps. If you haven’t used email to send or receive money via Square Cash in the past six months, that feature is disabled in your Square Cash account; you’ll have to log in and re-enable it. On the bright side, Square Cash still supports email and Web-interface money transfers via Square.me, but it’s only promoting mobile apps. The emphasis on mobile seems to be deeply entrenched now; I can’t find any discussion of it in the tech press, so it seems everyone’s taking it for granted. Way back in July, 2012, PC World published a prophetic article entitled, How Mobile Apps Are Changing Desktop Software. The rise of app stores is largely responsible for mobile’s preeminence over desktop software. These gatekeepers to iOS, Android, and Windows make it easier for developers to sell their creations and keep them updated compared to traditional do-it-yourself marketing and support. BlueStacks is the best way to get Android apps running under Windows. Google provides an official Android Emulator but it’s a formidable challenge for non-programmers; it’s really intended to let developers test their Android apps on their desktops. Remix OS for PC is an open-source project that turns an x86 PC into an Android device; don’t try this beta project on your primary PC. Microsoft is working on two ways to make Android and iOS apps run on Windows 10 phone or desktop systems. Project Islandwood does the job for Apple apps, while Project Astoria is aimed at Android developers. These toolkits are not for non-techies; using them takes a lot of programming savvy. But eventually, they may allow developers to write one program that runs on Android, iOS, or Windows 10. 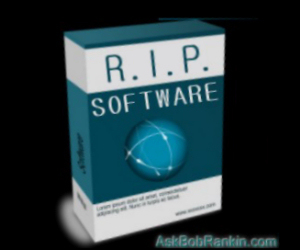 Most recent comments on "Is Desktop Software Dying?" There are many who benefit from smartphone and tablet apps. It fills a gap, but does it justify the avalanche of forced migration? Despite all the manipulations by the industry, it does not. It presents a new, exploitable opportunity with rapid growth at present. Desktop growth may have flattened, but there are still millions who buy them and they stubbornly refuse to go away. Desktops are like denim jeans. I have read a lo about Destinations on Google but cant find it in the app store. Is it buried inside another Google app? Agree hundred percent with MaryN. Cloud is rubbish when it comes to critical functions. I'm fortunate in that I haven't had too much problem running my older software. Main interest here is my photography hobby and Adobe's PhotoShop Essentials 12 works just fine. I am even able to run my old version of Word Perfect. Windows 10 is very good at adapting itself to manage software originally designed to run on older versions of Windows. Perhaps the best ever at this task. I have a new Dell laptop with i5 Intel processor....8 gb of RAM....1 TB hard disk....dual band Wi-Fi built in.....back lit keyboard.....and BlueTooth wireless all built in. I'm using a Microsoft BlueTooth mouse. Best I've ever used. I still use my HP desktop with larger monitor screen to manage my photo images. So I'm a happy camper.....for now, Bob. I do not use my cell phone for anything other than making and receiving calls. So I use mobile apps only very rarely. I have no use for most of the so-called mobile apps. I'm still thoroughly enjoying your newsletters and learn new things all the time from you. Thanks much. Uber has an app for Windows 10. This is like trying to compare a sports car with a heavy-duty truck. There is no choice to be made, because they are both designed for different purposes. One is mostly for heavy-duty lifting, while the other is useful for nimbleness and mobility. You don't have to choose between one or the other. Very apt comment by "nosietall". The question is why desktop software is lagging or altogether ignored? If you are on metered mobile with 5 gigs per month you can hardly run Win 7 anymore let alone 10. Does MS have any idea that there are many people in locations where very expensive and limited mobile is the only option. That issue alone will spell death for the PC, at least for a large minority. Bill Gates is certainly aware that countries are judged on how they treat minorities. How about companies who have an established commercial relationship such by virtue of a product purchased? I am a desktop lover through and through. There are so many things that are impossible to do on mobile devices. Not just that, but try playing a hidden object game on a tiny screen. If one is really doing work like video/audio editing, serious photography etc., a desktop with a decent sized monitor is necessary. I have been forced to purchase a tiny screen phone, and I use it for only two actions: as a phone and for taking photos on the run. That's it. I find the whole concept of tiny devices irritating at the very least. I found this article very interesting. For one thing, I didn't know that Instagram couldn't be run on a desktop or laptop---I just hadn't tried it yet. Besides being a professional writer, I also teach digital photography. The only-mobile app for Instagram tells me a lot about why the enrollment in my classes has dwindled recently. I suspected as much, but this makes it clear. Also, I use a lot of older programs for my work. They work just fine and really don't need any updates. I've found in the past that many updates just make it possible for software developers to say "look we have something new." I haven't bought any desktop software in almost 10 years! I just got automatically updated to Windows 10 on my laptop, which I didn't really like, but perhaps it's a good thing if the program allows me to run a couple of my older photography programs. I agree with those who are older but still very computer savvy. It's not just the young that use technology. I have a flip phone and it meets my needs and budget just fine. Some educational institutions have even changed access to their alumni directories so that without a smart phone and a dedicated "app" you are locked out and have no access to the directory. You can't look up a classmate or even update your own information from a desktop computer. What nonsense. They won't be getting any alumni contributions from me! I tried out BlueStacks from the link provided. I'm currently running Windows 10. Even after 3 tries at installing (and subsequently uninstalling) the current BlueStacks 2, it always results in a message that the install is corrupt; try again. I give up at this point. Is it just me, or does anyone else notice the "exit pop-up" when leaving this article? As your mouse/cursor approaches the Big Red-X to leave, an "exit pop-up" appears. I sent Mr. Rankin a private message and asked if he knew this was there. If he does know, then that's fine, that's his choice. But on the chance he didn't know, I wanted to point it out to him. And for the record, I make it a habit to never click on a pop-up and especially one that tries to interfere with my personal action, on my personal computer. If you search "exit pop up", what you get is a list of places to buy apps that create them and how to use them. I could not find even one app to install that prevents them. After decades of techs telling us to NEVER click on pop ups, why would anyone click on an exit pop-up? I will never click on an exit pop-up. Period. If you guys think I have a virus, or some kind of malware, then please let me know. But I only rarely encounter an "exit pop-up" when doing other things. In this article, it is each and every time (close the browser, come back, and do it again). Tekky Question: when confronted with an exit pop-up, would the Task Manager kill it? I've heard that even clicking the "X" to close a pop-up can be dangerous. Thank you ALL in advance for your time and attention. I appreciate any and all advice offered here today. Thank you. I find it really irritating that everything is pushing towards mobile devices and touch screens. I have a cutting-edge gaming laptop, but my cell is still an old flip phone that doesn't even have a camera. And I refuse to use the Cloud. My data is in my possession. I'm hoping this is just an industry phase. But maybe I'm just a dinosaur. I don't even have a mobile phone and learnt long ago not to trust a cloud system. I like my software where I can get at it when the cloud is down. I once spent three days working at my computer as my work colleagues filed papers and tried to invent things to do. The reason? Our local cloud had gone down and they all relied on it for their data files. Mine were all safely on my C drive and I could get at them.Taught me a giant lesson! I don't have a smartphone, only a flip phone, and then it's always off, except in the very rare instances I need to make a call. I don't even know what an "app" is. Never saw one. I hate the cloud. It's meant to take control away from you. Remember when personal computing was about empowering people ? Now everyone seems to follow the opposite trend. Compulsory and frenquent "updates", à la Windows 10, obey the same pattern : not only your data belongs to us, but your computer (or device) belongs to us, and we intend to do pretty much what we like with it. Including cutting you off completely if you don't agree with our "conditions". I still use Office 2003 and have no wish to "upgrade", thank you very much. I still have to wrap my head around Word 2003 completely, so what's the point of moving the goalposts and dis-empowering myself, for the exclusive benefit of Mr. Nutella's bank account ? I must say that I agree pretty much with all of the comments but what I would like to know is how are these mobile apps written? I've never seen an app to write apps, they must be developed on desktop/laptop computers. What is this, just another way to force the general population into the sheep mentality that business and government has been striving for? No thanks, if I don't have control of my own machines then I don't need them. From terminals 50 years ago forward back to terminals again today; though the current models are wireless and do fit in a pocket. These fools swarming to the mobile remind me of the children in a tale that was told to me many years ago: "The Pied Piper of Hamlin". No thank you, I'll do my computing on my trusty desktop--those nonessential mobile apps is like being under house arrest. There's more reader feedback... See all 59 comments for this article.